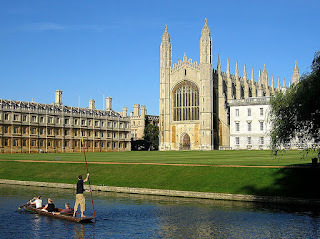 Cantabrigia (Anglice: Cambridge) est urbs Angliae in qua sita est Universitas Cantabrigiensis. Benedic nobis Domine Deus et his donis quae de liberalitate tua sumpturi sumus per Jesum Christum Dominum nostrum. Amen. Bless us Lord God and bless these gifts which by your generosity we are about to eat, through Jesus Christ our Lord, Amen. “Pro cibo inter esurientes, pro comitate inter desolatos, pro pace inter bellantes, gratias agimus"
I'm a fan of secularism, but isn't this new prayer a tad short? The first one (I think) is an abbreviation of a longer version, but the second is just "for x, for y, for z, we give thanks". It's little harder than a Latino sine Flexione version of the same sentence. Well, as long as students memorize both then it's a good idea. According to my Latin dictionary, "benedicere" must trigger the accusative when it refers to a thing (when the matter is to "consecrate" this thing). Thus they should say "haec dona" instead "his donis" !